Greetings all! Long time, no talk. 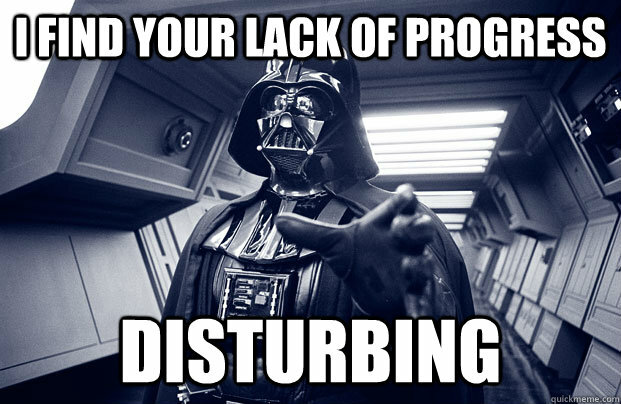 As you may glean from Darth above, I haven’t completed much in the way of tackling the mountain. A combination of work, summer heat malaise, and spending waaaay too much time reading up on and debating the merits of Age of Sigmar have steadily chipped away at my available time. I did pick up the Chaos models from the AoS boxed set, more because I think the minis are some of GW’s best work to date than I’ll be playing AoS with any regularity. But an AoS review is for another blog post. As you can see, very much a WIP. This isn’t all of my mountain, just what wasn’t sorted/fitting into the office closets. I still have the garage work area and shelves to clean up. 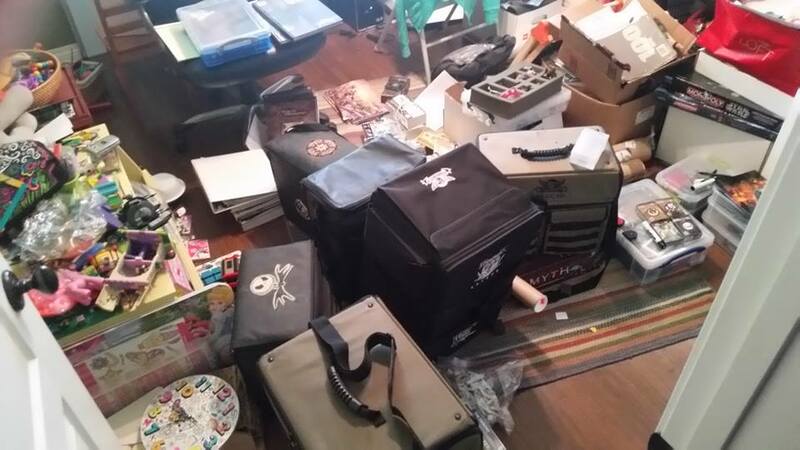 Part of the cleanup was to figure out what I was missing (for example, which Malifaux 2e Arsenal decks did I need and which had I duplicated because I wasn’t paying attention), what needs painting (too much), what needs to be sold off/etc. I’ll shoot a couple pix of where things stand now for the next update. So, now that those things are tidied up I feel better about moving on to Phase 2 (garage) and while that’s getting handled, painting. Our big summer Apocalypse game is slated for August 22, and I have several greenskins who still need some paint!! Well, this week was a bit of a bust. Too much RL intruded, and with a great Father’s Day with my beautiful daughter I ran out of time to actually get paint on any models. However, I did shop for some yellows for my Bad Moon Orks. I’ve always run Bad Moons (since they appeared in 2e), love that clan. My yellow mix has changed over the years, recently I adopted a more ochre than yellow style, but am now reversing it a bit and want a ‘dirty and bright yellow’ instead of the more orangeish ochre. That led me to the Ork project I posted about previously. We played a game of 40k on Friday night, had a great time, and got me digging through my collection again. And I know that doesn’t include Nobz still unassembled as well as plenty more boyz out there in my storage boxes. Going to start the full sortout tonight. 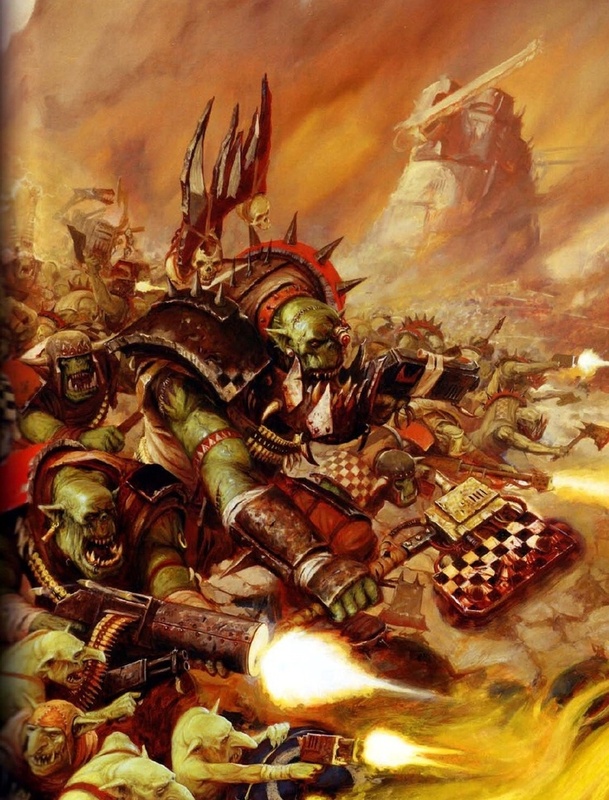 One of my side projects is working on my Orc(k)s. In this case, I’m picking up my 40k Orks and creating a detailed record of the Waaagh, including model counts, pictures, favorites, and so forth. I’m hosting a big Apocalypse game in August and so along the way want to ensure that my contribution to the carnage is 100% painted as well.